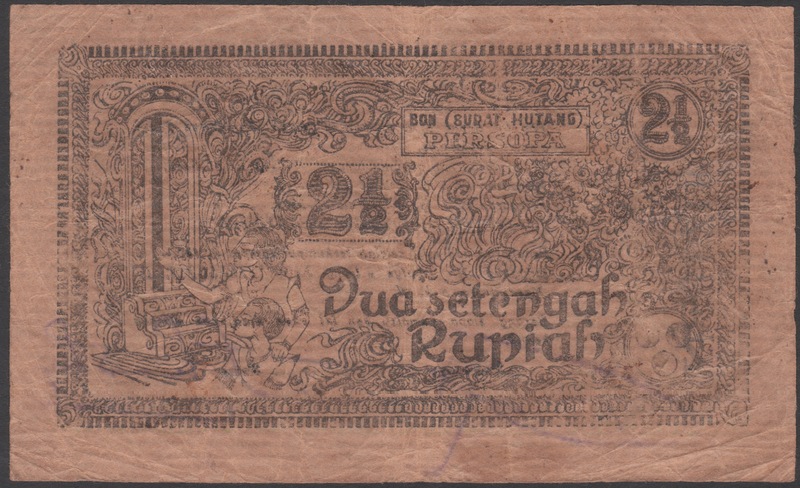 papermoney - Does anyone know more about this 2 1/2 Rupiah PERSOPA note from 1948? You are here : Home » All, Indonesian paper money » Does anyone know more about this 2 1/2 Rupiah PERSOPA note from 1948? Does anyone know more about this 2 1/2 Rupiah PERSOPA note from 1948? By Rob Huisman, March 2013. I came across this intriguing note in an auction in 2009 and was able to acquire it at a reasonable price. Recently I encountered the note again in my small pile of unidentified notes and notes with unidentified rubber stamp marks. Next, I spend a couple of evenings studying the note in detail and doing some research. This note origins from Pakualaman, a special and independent area in the sultanate of Yogjakarta on the Indonesian island of Java. It is a debenture that circulated between the end of 1948 until the beginning of 1949. 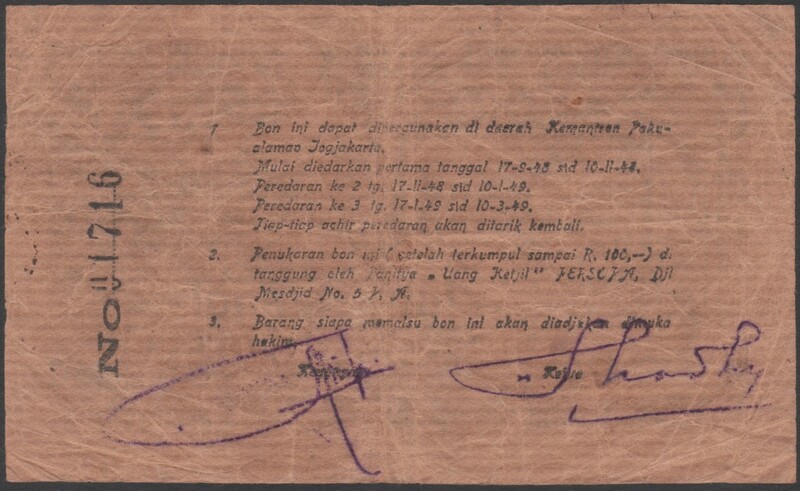 The note is printed on brownish paper that is very common during that period and frequently used for other notes in neighboring territories like Surakarta and Magetan. The artwork at the obverse is more detailed than other locally issued notes from that region. Similar to the 1948 Jogjakarta notes, it shows an interesting graphical representation of the 2 ½ rupiah value. There is a circle with three circles inside on the lower right corner of the obverse of the note. Two of the small circles are black and the third one is half black, symbolizing the value 2 ½. Both obverse and reverse mention the word ‘PERSOPA’ which is a name that I cannot find in any documentation or web search. From the context is seems like an organization or issuing authority but that’s just guessing. Could it be an abbreviation, like ORIPS (Oeang Repoeblik Indonesia Provinsi Sumatra) printed on the Sumatran Asahan notes? An interesting observation is the address mentioned on the reverse (point 3) where it mentions “Djl. Mesdjid No. 5, P.A.”. After some research it appears to be the exact address of the palace of Paku Alam VIII at the Jalan Masjid 5 in Jogjakarta. – What does the term “PERSOPA” stand for? – Who are the signatories on the reverse? – Does anyone know similar notes or other denominations of this issue?